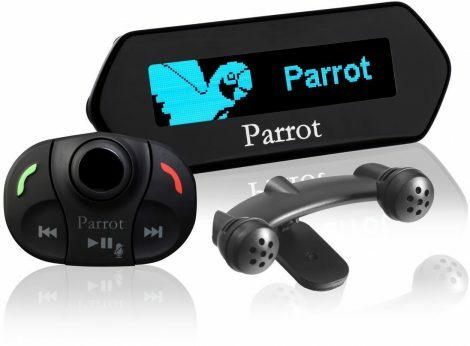 The Parrot MKi9100 is a Bluetooth hands-free system with an OLED screen. the Parrot MKi9100 boasts cutting-edge telephony functions: automatic phonebook synchronisation, speaker voice recognition, speech synthesis of the names in the phonebook, contact management (up to 2 000 per phone), call records, and so on. Its colour screen displays the phonebook, caller ID and photo, phone information and user settings. The menus and phonebook are also audible. The system automatically pairs with your phone when you start the vehicle once connected it will allow you to take phone conversations on the move without the need to handle the telephone and delivers hi-quality conversations whatever the conditions are. The parrot MKi9100 comes with a specific cable that supports iPod USB and 3.5mm jack enabling you to play your choice of music through the stereo of the car.